Nope. Still only your side. Gizmodo reached out to the Sheridan Police Department as well, who confirmed that Witt actually stabbed himself. And on top of that, he originally told police that his attacker was a “black male” in his mid-20s. Col. Landa , or Donny "The Bear Jew"
More like Dudley Do-Right shaming Sergeant Shultz. Same here. My reference was to rstrong vs. gullible Nazi/KKK sympathizer Oliver! How could anyone be so dumb as to believe that our side is knifing people over a haircut unless they're that desperate to minimize how repugnant their Nazi/Klan brethren are? I don't recall that I've supported either side. How do you get "your side?" Why does everyone in this forum have such a mean streak? Again, I've said nothing to indicate I support any "sides" in this debate name-calling fiasco. My words were violence begets violence. I get, that because I DON'T support "your side", that makes me a KKK/Nazi supporter; is that correct? Speaking of a mean streak, I've said nothing or done anything to indicate that I'm a Nigerian spammer as accused by your admin who relegated me to this section of your forum. I have no permanent home, therefore I use privacy settings; and because you folks have had problems with other posting members, (I can't imagine why) I'm automatically a villain. Seriously, your forum has nothing that I would recommend to someone seeking to join in spirited debate over current issues; unless they enjoy being bullied, trolled, or interacting with mean-spirited, name-calling, narcissists. While I'm here, you people don't seem to get that tearing down Crosses, monuments, and statues does not accomplish anything but make you all warm and fuzzy in your misguided belief that you have actually accomplished something beneficial to all and now you're happy that YOUR will has been imposed on others. Regardless of the history behind what a statue or monument was erected for; whether it was dark history or a joyful, commemorative moment, the fact remains that despite the destruction, the history is still there; you can't change that. 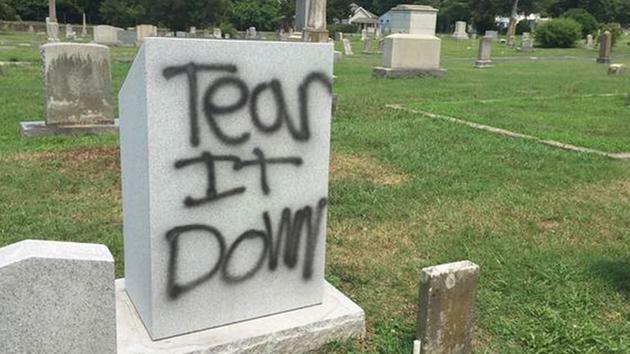 Destroying what some people hold sacred only leads to more hate and violence and racism. You can't seem to see that. 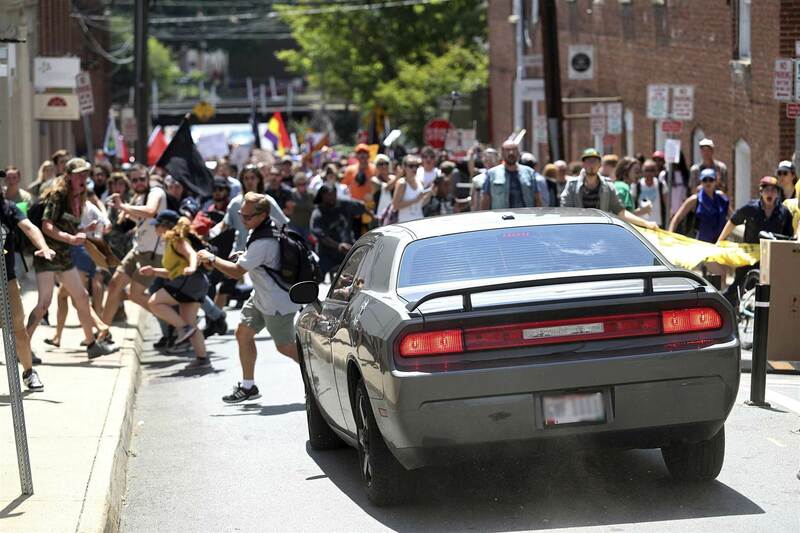 Demand that lawmakers in North Carolina reject legislation that would allow people to run over protesters. Yes, "the history is still there." But people make choices as to what they'll commemorate. At the risk of being godwined, I'd ask, why are there no Adolph Hitler High Schools? Sounds like there should be, "it's a beautiful afternoon in Munich, and the Fighting Nuns from Maria Ward are taking on the Youth from Hitler High in the girls city championship..." Ridiculous? Not at all. Not naming a school for Hitler or not having a statue of Hitler dramatically pointing the way to a victory that was lost doesn't mean he wasn't a part of history. It doesn't change the history that he was a part of. But neither does it literally "put him on a pedestal" as a remembrance to be honored. It's a relatively free country - if somebody wants to fly their whatever flag in their backyard or wants to put up an alter to Jefferson Davis or Hitler or Stalin or Trump, I've got no problem with that. Why should that stuff be on public property, supported by the government? Violent racists don't need a reason to be violent racists, and it's stupid and disgusting of Oliver! to make excuses for them. "the history is still there" in museums, books and documentaries, ALL of which say that the South team LOST. Otoh, "the history" of these monuments honoring slavers is that almost all of them were erected to support Jim Crow or oppose civil rights. We "can't change that" despicable history but we can stop cheering it on our public lands. As O Really implies, Oliver! and the Nazi/KKK team can get off of their lazy, pasty butts and raise the money to put their adoration for traitors on private land. We decent folks are just tired of hosting their whiny loser slacker ilk on our public land. Next up, Oliver! demands public land statues honoring Timothy McVeigh and the 9/11 terrorists, because "history". Our nation's wars have been an object of protest too; There goes Arlington National Cemetery. You are one weird character, Hondo. I'm not going to waste my time in replying to your baiting and hatefulness. You really take the cake. Seriously? You don't know the difference in gravestones and statues? It is difficult to get a neo-Nazi to understand something when his claim to NOT being a neo-Nazi depends upon his not understanding it. That's half of why neo-Nazis like Oliver!/Mr.B/etc. seem so pig-ignorant. The other half, of course, is actual pig-ignorance. Of course I do silly. 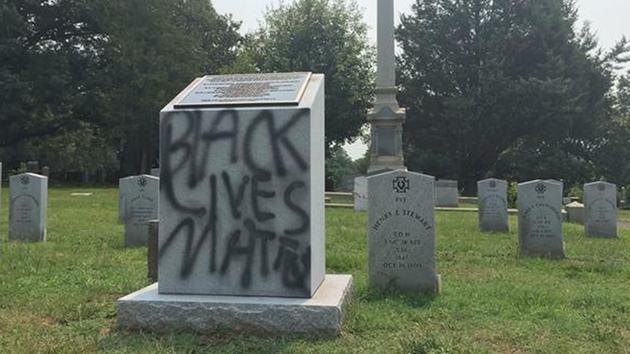 The gravestone in this photo is that of a military man, something that the offended wingnuts find to be so offensive, they have to be destroyed along with other historical monuments, statues and whatever offends them at the moment. You just gave the best example of your "actual pig-ignorance". For what it's worth, I've seen pigs way more intelligent than the lot of you.